Donal Murtagh Mobility Ltd Wheelchair Cars and Mobility Car Conversions indoor showroom & state of the art workshop facility is located just 2 minutes off theM6 motorway at Exit 6 Moate Business Park, Moate, Co Westmeath. Just one hour drive from Dublin & Galway and open 6 days a week. Can’t travel? No problem! Just call us and one of our experienced advisors will come to you! We are countrywide leading specialists in wheelchair accessible cars and mobility car conversions. 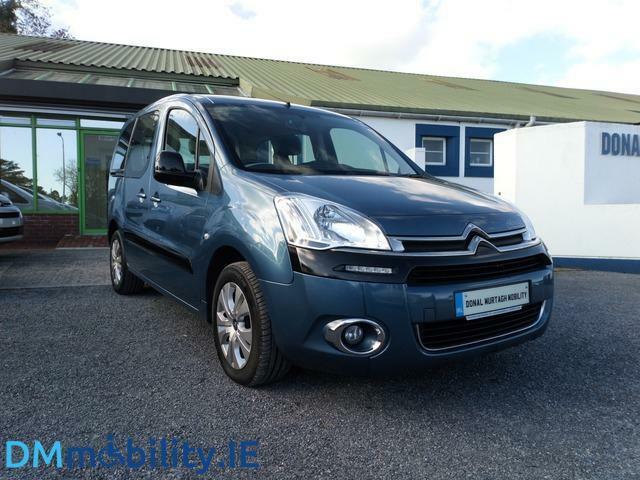 This low mileage mobility car is in immaculate condition; The Berlingo is a convenient size car but still has the space to accommodate up to 3 passengers along with the wheelchair user who can sit alongside the other passengers in the second row. They are also a quiet and comfortable car to travel in with independent suspension for the sometimes bumpy Irish roads. This car is suitable for manual wheelchairs, powered wheelchairs or mobility scooters. Why buy your mobility vehicle from us? When you contact our company you can be assured that you will receive honest, credible, experienced and knowledgeable advice on the best vehicle or conversion to suit your needs, •	We will take care of all the Revenue Vat & Vrt documentation on your behalf. •	We can supply you with a free temporary vehicle if required. •	We go to your house for Free No Obligation home demonstrations. •	We treat all our customers with the upmost compassion and honesty. •	We can tailor the car to suit your needs. •	We build and trim finish our cars to the highest standards. •	We actually build and have in stock the 60 cars we advertise (unlike others). •	We supply all our cars with new NCT tests and refurbished to the highest standards. •	All our cars come with our own 12 month comprehensive warranty. •	NSAI certified workshop and converters. •	2017 Midlands Enterprise awards finalist. •	We promise 100% Customer satisfaction. Vehicle Specification: •	4 point wheelchair securing system. •	Wheelchair winch optional. •	Lowered floor conversion with lightweight ramp. •	One or two rear seats optional. •	Luxury interior trim & seating. •	Metallic paint. •	Electric windows. •	Remote central locking. •	Air Conditioning. •	Supplied fully serviced & refurbished to the highest standards. •	NCT tested. •	12 Month Warranty. For any further advice or questions you might have please don’t hesitate to contact us: Donal on 087 8400403 or donal@dmmobility. ie David on 087 3994500 or david@dmmobility. ie Office 090 6481050 Web; www. DMmobility. ie View our full range of Wheelchair Cars, Mobility Cars, Drive from Wheelchair Cars and Disabled Driver & Disabled Passenger Conversions with Useful Disability information online on our website. Prices are ex Vat & Vrt for Primary Medical Cert holder. *Donal Murtagh Mobility* Moate, Co Westmeath Call 9am-7pm PH: 090 6481050 www. DMmobility. ie Ireland's Leading Wheelchair Accessible Specialist!